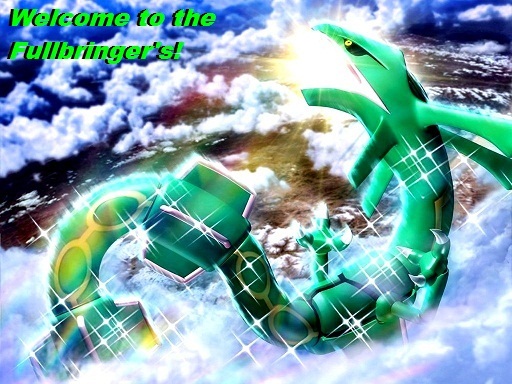 Introduction: Welcome to the home page of the pokemon clan known as the fullbringers we are mainly a pokemon online clan and the download for that software may be found here however we also do play some pokemon showdown which is a site and this is that sites link so now that you know that let us move on. A brief history: Originally an all dragon type clan founded on several small forums by one Pervy Sage-Silver and his co-founders J-pop princess and Luthien other wise known as Soma. Within later time a small clan known as the Kaiser dragons merged with us after losing a war hence how Indigo Wyvern came to join our great clan and make it that much greater! Since then we have fought many wars and allied many clans. Requirements to join: Joining the clan is simple enough. If you're applying from pokemon online you must have 1250 in any 1 tier to join automatically or if you apply from pokemon showdown simply have 1300 in any 1 tier. However if you fail to reach the automatic entry requirements you may battle the leader,founder or a co-leader and win or lose the you will be put up for a 2/3 vote and if you pass the vote you're in. For all questions and or comments please refer to the leader for they make the rules and all rules are subject to change upon founder decisions or co-leaders votes. Ranking within the clan! Is an important thing for deciding active and innactive members as well as who should and could be on the war team so do report your wins and losses to excel and rank and farther the clans greatness as well as your very own! Master - Win 100 battle's within the clan. Dangerous - win 75 battle's within the clan. Skilled - win 50 battle's within the clan. Talented - win 25 battle's within the clan. Promising - win 10 battle's within the clan. Newbie - win 5 battle's within the clan. Recruit - New member's start at this rank. We also have a battle frontier for those interested to try out simply pm C.C or J-pop princess and to challenge it just find a frontier brain on PO or showdown or post on their thread. The frontier can be found on the home page and in this section. Hey Silver! Its me indigo! I know I said I'd quit but I'm back and battling again. What do you say? May I join the fullbringers? Experience: I use to run the kaiser dragons and I'[ve battled almost as long as you silver. Yeah I know you didn't ask for a form but you got one anyway,hope to see you soon. Indigo Wyvern wrote: Hey Silver! Its me indigo! I know I said I'd quit but I'm back and battling again. What do you say? May I join the fullbringers? ACCEPTED! Welcome to the clan! Also....I'm the new co-leader! Yippee! Whoa I'm sorry for not being here you all. Got more hours at work so I've been busy but no worries I'm keeping it real. Just figured I'd stop by and livin up the place. KONICHIWA! Just posting an activity post and letting you know I'm going try and recruit some newbies for the site/clan. Wish me luck! Indigo Wyvern wrote: Just posting an activity post and letting you know I'm going try and recruit some newbies for the site/clan. Wish me luck! You are only the temporary co-leader until we find somebody with more time on their hand's. But you and I already discussed that. Glad to see the clan is doing well for itself,honestly I'm proud of it and all of you! Understood and I did ALREADY know that so thus your post is semi-redundant. All right all right already. Well on another note I'm hoping that a great battle by the name of super unknown person will be joining us soon,he is an excellent battler and would be great asset to this clan. So if he join's then welcome him with open arm's! Here's to you if you decide to join SUP! @Silver Thanks man and your right I do need it! Well just being active...haven't seen no "sup" guy around either. Also Silver your last post was full of spelling errors,so not like you man. Okay lets stop the fighting now. Glad to see the clan is well. The temporary co-leader of our fine clan (J-pop princess) is being replaced by our new permanent co-leader (Indigo Wyvern) I hope this change doe's not affect anybody to heavily. Thank you for all of your hard work Indigo and we look forward to seeing how you lead the clan in my abscence. And J-pop princess thank you for co-leading for nus for so long,you truly were and are still a great benefit to our fine clan. I hope we can all do our best for the sake of this clan. LONG LIVE THE FULLBRINGER'S! I humbly except this position and thank you all. Just figured I'd let you all know. i know i said i wouldnt but after talking to j-pop and indigo and after much consideration i have decided to accept the offer to join,if its still open. Flareblitz wrote: i know i said i wouldnt but after talking to j-pop and indigo and after much consideration i have decided to accept the offer to join,if its still open. ACCEPTED! I've heard good thing's from Indigo about you. I am sure that you are plenty qualified to be among us and I warmly welcome you to our clan! Read the rule's,battle a lot and never hold back! Enjoy your time with us...my fellow clansman. Okay so I went to the supremacy league and battled one of their big shot's. They agree to war,rivalry etc. Sure hope we fullbringers can take home the win. Indigo Wyvern wrote: Okay so I went to the supremacy league and battled one of their big shot's. They agree to war,rivalry etc. Sure hope we fullbringers can take home the win. Awesome and I told ya so! Pretty nice huh? Also Blitz I made that avatar you wanted I'll just pm it to you kay? I like it....I like it a lot! I shall immediately change that to our clan's main signature. Very good Hilda,your work is as great as always! notes: switch out that altaria for something like a chesto rest kingdra or maybe a sub roost dragonite,ok j-pop? Just stopping by to do my duties don't mind me. Just being active as always. Sorry I've bee losing so much lately well least I found us a rival clan! J-pop princess wrote: Just being active as always. Sorry I've bee losing so much lately well least I found us a rival clan! Yes you did do well at that. Well everybody I am glad to see our fine clan going smoothly. It's nice to know we are doing so good even though we were cast from parukia and lost not one but two fine dragon warrior's. However we did not stop and we never gave up so here we are today! LONG LIVE THE FULLBRINGER'S! all right? I'm just activity posting.